As we recently reported, the Arterton Inn of Court held its first substantive event on the 2018-2019 session, and WHIPgroup attorneys played a major role in preparing the event. The event, which took place at the New Haven Federal Courthouse, featured a mock oral argument before three federal judges (Arterton, Shea, Meyer) based on a currently pending case before the Federal Circuit, Campbell Soup Company, et al. v. Gamon Plus, Inc. Attorney Patrick Duplessis drafted the bench memorandum for the judges, and attorneys Walter Welsh and William Birks successfully argued for the Appellee—winning unanimous approval from the panel of judges. The facts of the case present interesting issues regarding design patent obviousness analyses—ones that we expect may lead the (real world) Federal Circuit to create new law when it decides the case later this year. By way of background, Appellant Campbell Soup bought approximately $31 million of soup can gravity feed display racks from Appellee Gamon and installed those racks in supermarkets across the U.S. Campbell Soup derived substantial increases in sales from the use of the Gamon racks, and that they were praised by customers. After a few years, Campbell Soup stopped buying Gamon’s display racks and began to buy and use display racks manufactured by a third party. The evidence presented at the PTAB showed that the replacement display racks were clearly copied from Gamon’s display racks. Gamon filed suit against Campbell Soup and others in the Northern District of Illinois, and Campbell Soup responded by filing petitions for IPR against two design patents. The PTAB upheld validity of Gamon’s two design patents, and Campbell Soup appealed the PTAB’s decision to the Federal Circuit. One of the main issues on appeal that was addressed at the mock oral argument is whether the Federal Circuit should reverse the PTAB’s determination that Campbell Soup failed to show obviousness of the design patents in view of U.S. Patent No. D405,622 (“Linz”). 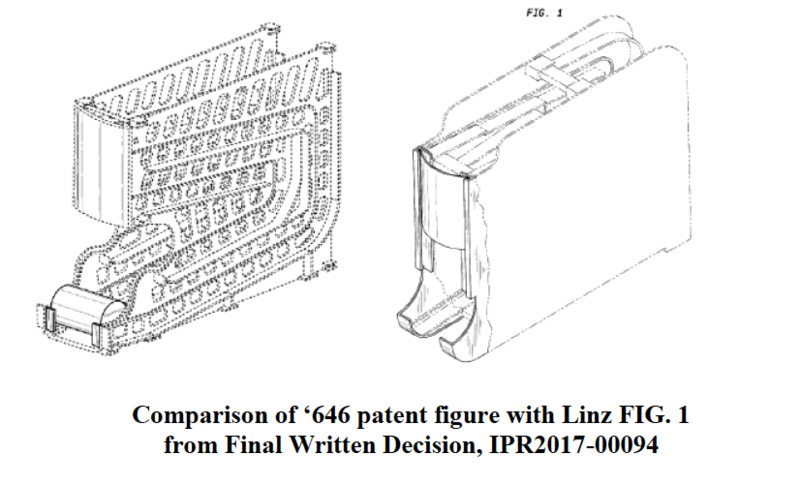 In particular, did the PTAB err in finding that Linz was not a proper primary reference for purposes of an obviousness analysis, because Linz did not create “basically the same visual impression” as the claimed design? WHIPgroup attorney William Birks convinced the panel of judges that the PTAB was correct when it determined that Linz’s design (see below right) did not create “basically the same visual impression” as the claimed design (see below left), because Linz’s design lacked a can in the display rack. Mr. Birks distinguished the facts over the Federal Circuit’s previous holding in MRC Innovations, Inc. v. Hunter Mfg., LLP, 747 F.3d 1326 (Fed. Cir. 2014). In MRC Innovations, the Court found that a prior art football jersey (for wear by a dog) created “basically the same visual impression” as the claimed dog jersey design, and thus the prior art qualified as a “primary reference” for purposes of an obviousness analysis. This was despite several differences between the two dog jersey designs, including the shape of the sleeves and the use of ornamental stitching. Mr. Birks explained that the prior art dog jersey in MRC Innovations at least included all of the claimed design features, albeit with differences. In contrast, Linz’s design was completely missing one of only three design features (i.e., the can). WHIPgroup’s success in the mock arguments before a panel of three federal judges may foreshadow a similar outcome when the (real world) Federal Circuit decides this case. At a minimum, we expect the Federal Circuit will clarify the extent to which a prior art design can differ from a claim designed and still be considered a “primary reference” for purposes of a design patent obviousness analysis. If the Federal Circuit signals approval of the more-flexible approach advocated by Campbell Soup, the USPTO will have more leeway in rejecting design patent applications as obvious, which in turn will increase the complexity (and thus the cost) of obtaining a design patent.